Living in a foreign culture sometimes means eating things that look completely unfamiliar. It is both an unnerving and an exhilarating experience. More often than not I find myself loving this new dish and flavor, and a perfect case in point is udo (Aralia cordata). One of Japan's many sansai (mountain vegetables), udo is a spring favorite that's just being pushed out now by summer fare. The farmers, Takashi-san and C-chan, introduced me to it during a visit to a neighborhood izakaya (a Japanese tavern) one evening. I was so enthralled with the texture and flavor (good crunch with a tiny bit of ginger-esque zip) that they showed me where to find it locally and gave me a recipe while we worked in the eggplant field the next morning. 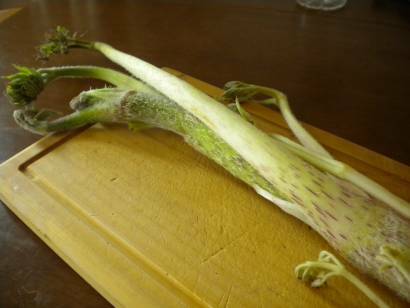 Suffice it to say, I decided to share this weird looking yet tasty vegetable discovery with readers over at eco+waza. Give it a read and mark your calendar for next years eating delight!